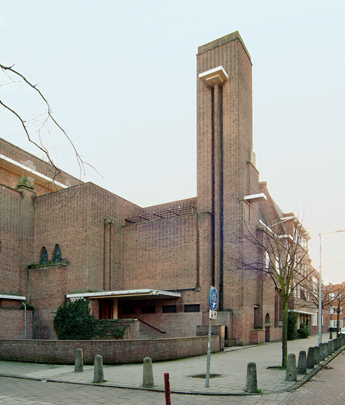 The articulated masses and mute brick planes with leaded windows and granite doorsteps and granite lintels and edgings constitute a Cubist variation of the Amsterdam School heavily influenced by Frank Lloyd Wright. The porch and marble-walled vestibule lead to the lofty synagogue itself. The women's gallery, supported by a row of columns dressed with glass mosaic, frames a prefatory space. The Holy Ark, the synagogue's most sacred feature, is placed in an elliptical recess.